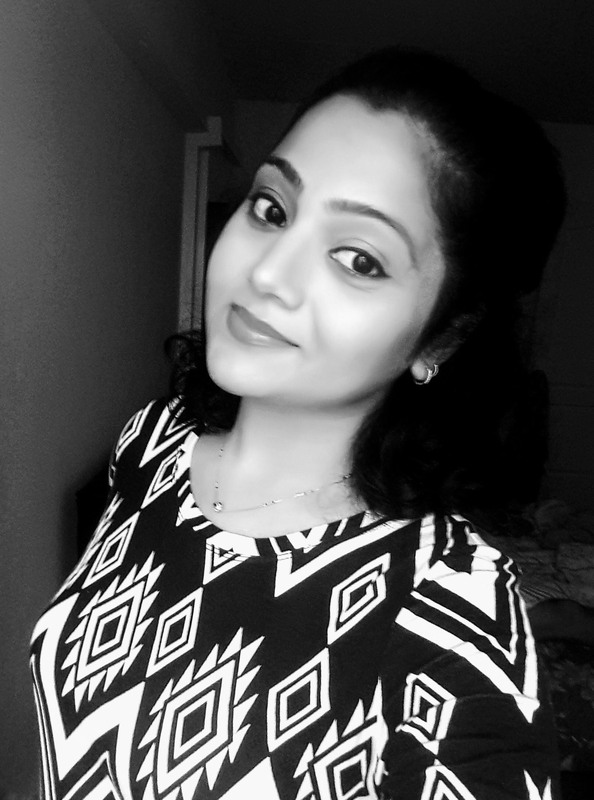 My name is Sarika Singh Parihar and I am a self-taught Madhubani Artist. l have been doing Madhubani art for a couple of years now. Though I was interested in art since childhood I started painting only after getting inspired by an artist friend. 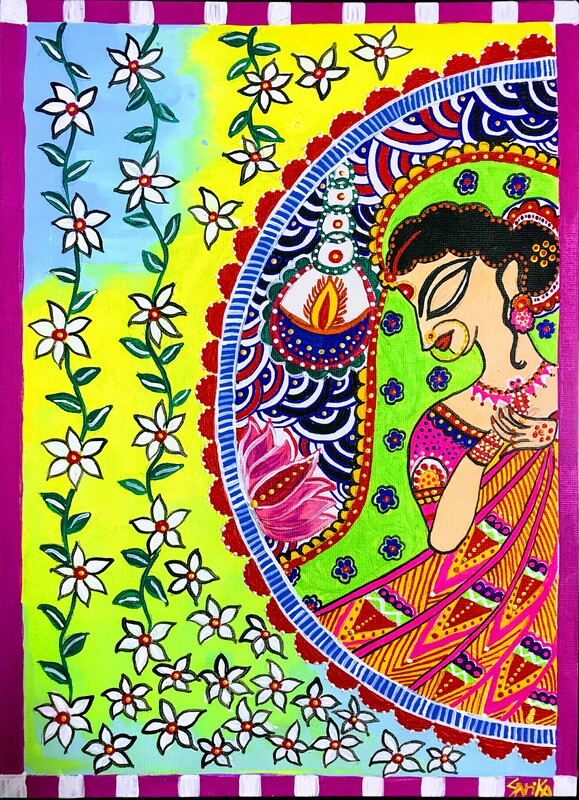 I started with doing basic paintings and finally I came across an attractive and aesthetically beautiful piece of art called Madhubani or Mithila paintings. Madhubani is a district in the Bihar state of India. 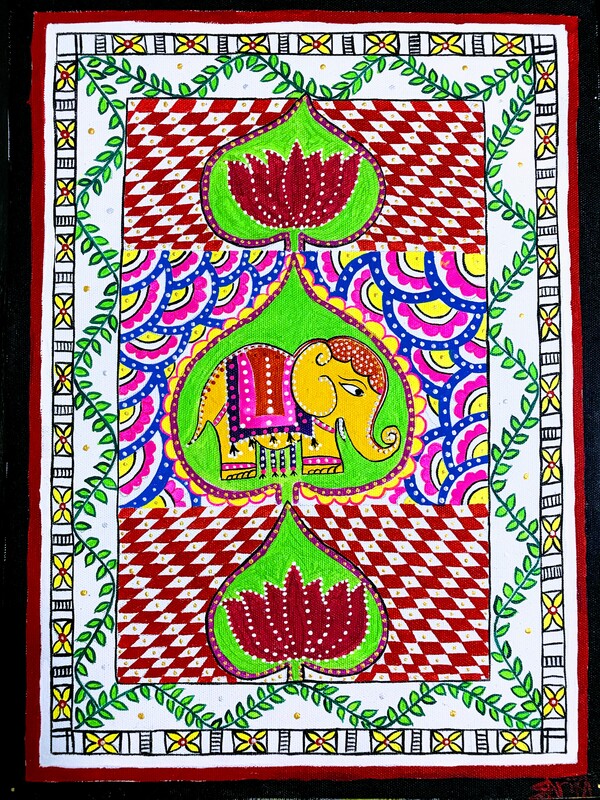 Madhubani literally means a sweet voice or a sweet language or it can also mean a forest of honey in Hindi. It is one of the most ancient and famous art forms of India and Nepal. Every artist makes a choice about an art form that he or she would like to pursue seriously. For me it had to be Madhubani because this art form stole my heart right away and I knew this is what I wanted to create. The liveliness and vibrant colors used in this art form would catch anyone’s attention. 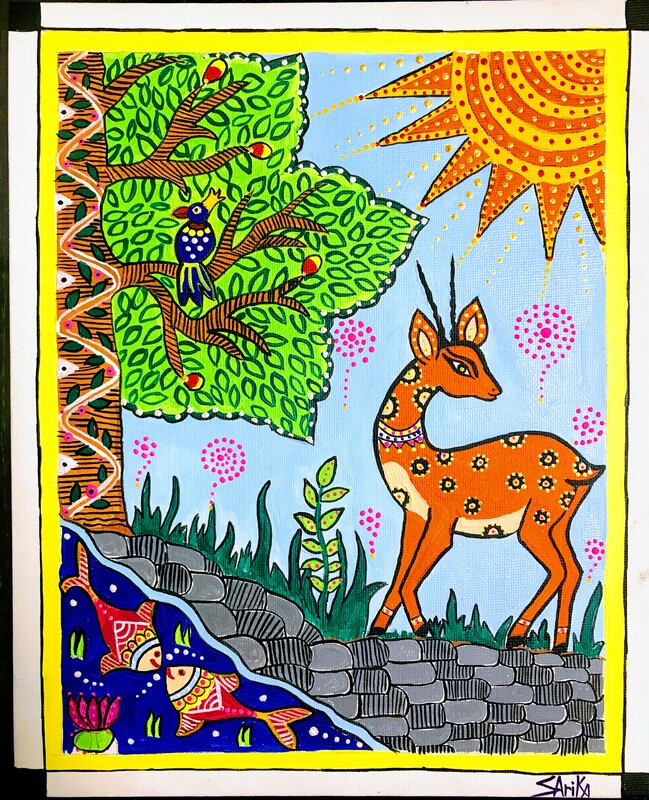 Madhubani paintings take me back to my roots and remind me of my culturally rich India. History: Madhubani is 2,500 year old art form dates back to the days of Ramayana, when king Janak asked his artists to paint the wedding ceremony of his daughter Sita and Rama. These paintings were usually created by women on the walls and floors of their homes during festivals or other special occasions. Originally these paintings were made using fingers, twigs, brushes, nib pens or kalam using natural dyes like charcoal, soot, turmeric, sandalwood and extracts from leaves and flowers. Madhubani paintings always depict humans and their association with Mother Nature. They also take inspiration from mythology. Natural elements like the sun, the moon and flora and fauna are widely used. The paintings portray scenes of royal courts, wedding rituals, festivals or any other social events like Durga Puja. No blank spaces are left and the borders are adorned with different geometric patterns like lines, circles and triangles and floral patterns. Madhubani art is an incredibly exclusive art form as the artist does not use any subject or stencil but uses his instincts and imagination. This art form doesn’t force you to follow or copy any pattern or make an exact replica of any object, instead it gives you complete freedom to imagine and create anything keeping the soul of Madhubani intact. One has to just create figures which are prominently outlined, have big bulging eyes and a pointed nose. Isn’t that exciting? Re-discovery: In the year 1934, when Bihar was hit by a massive earthquake, a British colonial officer on duty of inspection of destruction chanced upon these paintings on the interior walls of houses. He was so amazed to see these paintings that later in the year 1949, he brought these paintings to public attention by publishing them in a news journal. This is when this ancient art form was noticed by the world. The first three forms were used by upper caste women and the remaining two forms were used by lower castes in the olden days. After gaining attention and love from various art enthusiasts nationally and internationally, Madhubani art is now open to everyone leaving the caste system and discrimination behind. Recently Madhubani paintings came into limelight when some local artists of Darbhanga region of Bihar decided to renovate the Madhubani railway station with huge paintings on the walls of the station. The paintings span 7000 square feet and are expected to attract more tourists to Madhubani. The local women artists also gave a makeover to the Sampark Kranti train coaches to create awareness about the art to wider audiences. 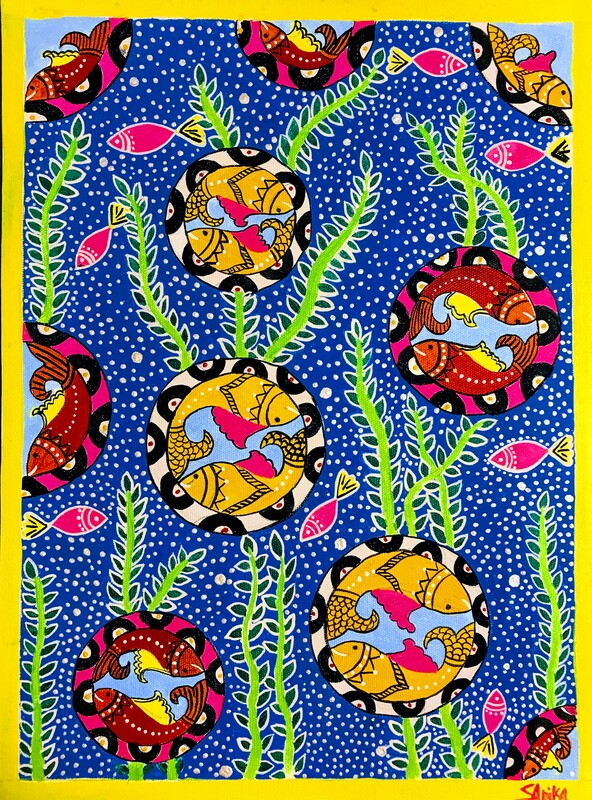 These days Madhubani paintings have taken contemporary twists and modern forms. The younger artists not only make the traditional Madhubani paintings but also customize their art to address the current issues in the nation. It is interesting to know that the paintings which were created by rural women to depict culture, tradition, religion and social norms are now being used to make their voices heard. Madhubani paintings have a similarity with Feng Shui. Lotuses, birds, fishes and turtles that are widely used in Madhubani art are also used in Feng Shui. Consequently Madhubani art has its divine and spiritual side too. I really hope that my Madhubani paintings get love from all Hong Kong Desis and create awareness about the art form among our younger generation who are living away from India. Please help me let them know and let the world know how colorful, how diverse and how magnificent our Indian art forms are! Keep it up Sarika. Interestingly my daughter has also started Madhubani in her school recently. We bought Rotring pen for her.